Newcastle 20 ‹ Series 12 Reversions ‹ Flog It! The Flog It! team is in Newcastle upon Tyne at the Discovery Museum, the region's science and social history museum. Browse content similar to Newcastle 20. Check below for episodes and series from the same categories and more! an area steeped in shipbuilding heritage. have defined the landscape and left a legacy for generations. has had on the people of Tyneside. now part of our nautical history. This is the first ever steam turbine powered ship. it was easily the fastest ship in the world. that's housed here at Newcastle's Science And Local History Museum. And today it's the host venue for our valuations. The people of Tyneside are arriving in their droves. -Oh, look, a bit of maritime memorabilia. What's this? We shall be talking about that ship later on in the programme. we have the antique elite reporting for duty. Always with a keen eye for detail, Anita Manning. Oh, it's great fun, isn't it? Great fun! but Adam Partridge seriously knows his stuff. -How much do think it's worth? -It's going to be priceless! They're a lively bunch here today! Let's hope today's valuations are as entertaining. when a legendary billiards champion challenges her to a game. -You can give me a few tips. -It would be wonderful to get you in action! A lot of men have said that! with a signed copy of Muhammad Ali's autobiography. to get their antiques and collectables valued. for all the shops in the local area. we got the cameras and the people of Tyneside have brought the action. what you're going to find. right here, right now, on Flog It! Let's hand things over to Anita Manning. Could this be the item? at this moment of being sitting next to a legend. where you got these napkin rings. the world championship. I was booked in at Karachi to play an exhibition. I made the highest break that had been made in Karachi - 319. -So this was a little gift? -I wonder what they're worth. They've never been touched. I'm not going to put these on my table! I'm not that - what do they call it? - aristocracy! or the Duke of Northumberland's. But not on Alf's table! But there are quite a nice present. Could you tell me when that match was? When you were in Karachi. -Yes, it would be 1964. -1964. Let's look at it. "Kashmir Silver Works," and it's from Karachi, the main city there. They are what I would call white metal. They could be a low-grade silver. -you had silver which was of a lower grade. So they can be that. there's a little cartouche where you could have put your initials. -They could have put "Alf the Champion." Have you retired now, Alf? I've retired competitively, but I still go and practise. not many people will think of this - I'm in heaven! that billiard table is heaven to me. And this is you as a...? That is me in London in 1955. That's the Northumberland and Durham Snooker champion. -You were quite good-looking guy. -Well, to me they're inconsequential. As soon as I die, they're in the recycling, or wherever. You have your photographs and you have your memories of Karachi. So shall we put these into auction? -They're not worth a lot of money, Alf. £50 to £70, something like that. That... That is a...terrific amount of money. We'll maybe put a reserve of, say, 35 on them. -I'm sure they'll do that. and you can give me a few tips. It'd be wonderful to get you in action. A lot of men have said that. What a really interesting man! You never know what or who is going to turn up on evaluation day. Now, over to Adam Partridge. It was a good way of illustrating what this object is. So, where did you get from? I don't know. It's always been in... in the family. It's just always been there? -I don't which side of the family, but it's a family thing. Instantly, the answer's yes with this. The date line is 1947. If there's any doubt, it should not be sold. But this is late...right at the end of the 19th century. -From Canton. Canton in China. because there are a lot of these about. and shipped it to Europe. And they are all a similar type of style. There's been a resurgence in the Chinese market. erm...interested in their history and heritage, et cetera. strong prices for ivory card cases. Got lots of stuff that, yeah, time to go. -Let's get it and flog it! but my estimate is higher than theirs. -Do you have any idea on what it's worth? I am going to suggest 300 to 500. -Which is a pleasant surprise, isn't it? And I think you should make that. is a little bit of damage. -Just a very small bit of a crack on the top there. I really don't think that matters that much. And I think it's a pretty good example. Well we'll take it to auction and see what happens. Because my feeling is that it might make a bit more. -That's a pleasure. Lovely thing. to something on a slightly larger scale. something I'm familiar with, these colour schemes! Yes. It is very much of that period. It is from the 1973 cruise ship Vistafjord. -These were the original swatches for this vessel. The interior designers would have worked from these. -obviously, with the client, said, "Yes, let's go for that." I'd be a happy bunny. Well, the ship is still running as Saga Ruby. Does it have a colour scheme like this? Eh, I doubt it, she's been majorly refitted three times. 1973, last cruise ship built on the Tyne. -This is the golden era, isn't it? This is what Great British engineering was all about. -Superb lines on a superb vessel. -Thank you so much for showing me this. and finding out more about the last shipbuilders on the Tyne. final valuation before our first visit to the auction house. -going on round about, isn't it? You've brought us a wee couple of scamps along today to look at. So tell me a wee bit about them, tell me where you got them. befriended a German prisoner of war. and long after George - that was his name - went back to Germany. Did you ever visit him in Germany? Yes, we visited several times, him and his wife Carla. One of the times they gave us these two figures, Max and Moritz. -No, I'd never heard of them, I'd never seen them. -Not really. They're not really my thing. and they're very well-known to German children. And they were BELOVED of the German children. This wee guy here is bronze. He's well cast, he's well modelled and he's sitting on a marble base. an indication of who did the bronzes. and that makes them interesting. -..in the region of 150 to 250. -Would you be happy to sell them at that? Have you been dying to get rid of them for years? Well, no, I hadn't even thought about it, but that's very nice. so I think we'd have a day out at an antique fair. and that you will fall in love with? Maybe a bit of jewellery. -Shall we put a reserve on the little figures? We'll put a reserve of maybe just 130, just to protect them. and that they will be well-fancied by the buyers at the auction. -Good, I look forward to it. -Thank you very much for bringing them along. Let's see what's being served up right now. 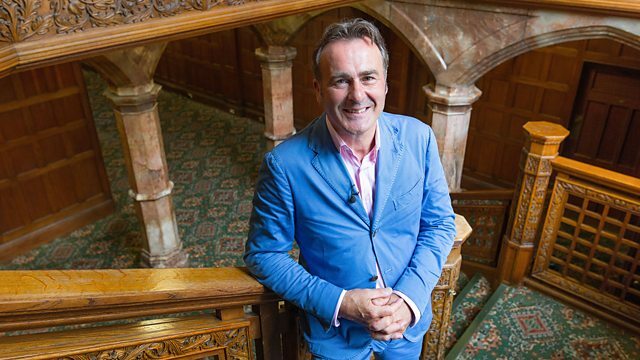 Graham, thanks for coming along to "Flog it!" And it's always nice to see things of local interest. -You've got two volumes here of the History Of Newcastle. From an antiquarian book shop. -How long ago did you...? So, not that long ago. Do you have a collection of antiquarian books? -Most of it. Most of it. -And you're starting to sell this off? So you've got the two volumes here. A well-known book by Brand, isn't it? the main page we want to see is this title page here. Of The Town Of Newcastle Upon Tyne. -That makes it the first edition, I think. First edition, leather bound, with all the maps intact and everything. Let's show a sample of one of the foldout maps. There's a nice example of one. How recognisable is that nowadays? Other than the cathedral, nothing. -But that's a rather nice engraving isn't it? Black and white engraving. A good view of Newcastle. and explanatory texts of the history of this fine city. and now it's time to move them on. What do you think they're worth now at auction? I think probably around about the 300. Yeah, I think we should do that. well, if they don't make...? Would it be 300? Slightly less, 250? -Shall we fix the reserve at 250? And we can put an estimate then of 250-350.
you might end up drawing a bit more on them. and what better place to sell them than the local auction? and other naval vessels have all been built on this river. makes it the perfect location for shipbuilding. For 600 years, shipbuilding was the lifeblood of this area. was one of the last to be built, in 1993.
for thousands of families in this area. sons often followed their fathers and grandfathers into the yards. revolved around the shipbuilding industry. The bit I always loved was the process. and at the end of the process was something you could be proud of. and in your small way, there was part of you in that. 19th and 20th centuries, employing thousands of workers. that's where the energy came from. the life of the river. you knew somebody who did. move out - we might not see him for a couple of days at a time. And then he would come home and sleep the clock around. And then he would go back and it would start all over again. Family life was governed in many ways by tides and ships. these huge great supertankers looming over basically a back yard wall. And I think people had pride in them. They could see where their husband went. The kids could see it. "My dad, my dad's working on that." being built echoed up and down the river. It went on all day and all night. I think the main thing on the river in those days was the buzzer. when you started and when you finished. And I suppose people around that way, they lived their lives to the buzzer. signs of a once thriving shipbuilding industry. that was once Smith's shipyard. I've come to look at the Tyne's last shipbuilding yard, Swan Hunter. It was the biggest yard here. when the last workers left the site. Now that is what I call a view. Just look at that - the Tyne in all its magnificent glory. You can imagine the manager standing up here, can't you? Sort of saying, "This is our shipbuilding empire." but they could join in the celebrations of the launch days. thousands of people here in the docks and on the quayside. The day a ship was launched, it was a special day. There seemed to be a buzz went round the yard. "There's a ship being launched today. with their fancy hats on. The final chocks are knocked out. and there's a sort of, "Ooh..."
Then slowly, off she goes. Not in any hurry, just making her own slow way down into the river. to me in my imagination, the ship looks as though it was curtsying. And there was a space there for the next one. For the past 20 years, there has been no next one. modernisation and competition from abroad. There was meetings, marches, the unions were involved. There'd be a lot of sad, disappointed and I would think angry people. I think it was anyway. And that was so tragic. And it still makes me angry today. and some of them had a black plastic rubbish sack...with them. in a shipyard, coming up that bank, and I thought, "This is not right." It might have made sense to somebody, it didn't to me. caused by the end of the shipbuilding. will live on for generations. before you, your life's been a total success. You've created something. our day now, which means it's time for our first trip to the saleroom. of everything that's coming along with us. Will Alf's unused silver napkin rings draw in the local nobility? when it comes to Sally's ivory card case. are sure to get the local historians excited today. appeal to a buyer today? For today's auction, we're in East Boldon. serve both, and is often a measure of the times. Let's see what today serves up. Now, look, that chap's here to buy, he's picked up a bidder's paddle. and address and identify yourself. You can pick up a bidder's paddle, then you're free to bid. Hopefully, he's going to buy some of our lots. and do your sums, because it does add up. Right, let's get on with the sale. These 18th-century, leather-bound books are pure quality. Belonging to Graham, who is with me right now. you were lost in thoughts, weren't you? We're a couple away. Now, I know you paid big money for these, didn't you? -but you can forgive that. They are a nice, genuine, honest set. We're talking around what, 17...? Look, time is up, I'm getting a cue now, this is it. Your lot is coming up right now, so good luck. I'm bid 140 to start them. 380, front row - you're out, sir. At £380, and we're away. -Just knew they'd sell in the room, didn't you? -Oh, thank you very much. silver napkin holders from Pakistan. who is - who WAS, I should say - English billiards champion. -He's got a good tale to tell. -78 years, you've got a lot up there, you know. -He has got a lot up there. Our lot is coming up now. With me at £80. Anybody else? at £95, all done, at £95. -That would be a great break in snooker. -A poor billiards break, but a great snooker break. -Do you know where the money's going? of the English Amateur Billiards Association. because without any fresh blood, this sport would not carry on. the top end of Adam's estimate here. -It's a good 'un, isn't it? -I mean, it's incredible, where'd you start? for a little time now, don't know where it came from. All my life it's been around, just sort of sitting in a cupboard. Well, hopefully we should do the top end. And I think, yeah, I'm going to go for the top end of estimate. I'd like to think as well, fingers crossed. and I'm bid 160 to start me. -Worth a bit more, I think. At £260, are we all done and dusted? Well, it's gone, and we're happy. Yeah, not sitting in a box any more. -It's gone to somebody that'll enjoy it, hopefully. Well, our next lot is bound to put a smile on your face. Max and Moritz, the German comic figures. Jenny, I love them. And you can't help but smile, can you? and I can just imagine them, cheery little figures on the mantelpiece. Now we're going to put it to the test in the room. Let's find out what they think, shall we? Fingers crossed there'll be a couple of phone lines on this. -This is what you've been waiting for. This is what we've all been waiting for. Hopefully there'll be a surprise - here we go. little turned marble plinths. I'm bid 100 to start them. at 160, it's in the room. 170, no? At £160, all done? Well, that was fast and furious. That concludes our first visit to the sale today. by fine art and antiques and looking at the beautiful craftsmanship. His name is Thomas Bewick and he lived just west of Newcastle. This is the view that Thomas Bewick grew up with. He was born here at Cherryburn in August 1753. I am so in love with it. and some would say he was Northumberland's greatest artist. were hugely important to Bewick. He was the eldest of eight children. and by the age of 13 he even had his own flock of sheep. did some of his first illustrations. With no paper, he used bits of charcoal to draw on the hearth. Clearly, from early on, Bewick the artist was trying to get out. he'd go roaming around his beloved Northumberland countryside. he was sent to be tutored by the local vicar. on a seven-year engraving apprenticeship to Newcastle. It was the end of his childhood. "to the water banks, the woods and to particular trees." Bewick showed great aptitude towards wood engraving. home back here to Cherryburn. Thomas' beloved home is now looked after by the National Trust. which is this kind of wood. -Yeah, a dense grain, isn't it? It takes a few hundred years to actually grow to this width. A tiny piece of wood. It doesn't get much bigger. -It doesn't get a lot bigger at all. look like metal engraver's tools used to engrave sheets of copper. Yes, they're exactly the same that are used. and yes, they are exactly the same. cos your whole world kind of comes down to this little piece here. Yeah, this is one of Bewick's original wood engravings. because the ink sits on the surface of the block. -And he's done different things to sort of show distance. in totally one place, can you? -I can see that. Yes. that section there is lowered and it's got a grey tone to it. -It has, hasn't it? Which is a little bit lighter. and have prints to sell to the public. and keep the craft alive. became less frequent when his father died. Quadrupeds, a book that deals with 260 mammals from around the world. some celebrity within his own lifetime. and he pursued with a real passion. The March Of Intellect, as Bewick called it. fuelled by the voyages of the great explorers of the time. often preserved in the ship's rum. Bewick relied on taxidermy to make many of his illustrations. illustrations was very much the preserve of the upper classes. and starting a wider circulation. but because he was a very affable chap with no airs and graces. from all walks of life and he was so happy to share his illustrations. and looked at his work in awe. of Newcastle, the location for our valuation day. which is good news for us - more antiques to value. It's over to Adam Partridge. when I saw you with the Muhammad Ali boxing memorabilia. Tell me, how did you come to own this? Well, I went, like it says on the programme, in 1978 to watch him. -At the Las Vegas Hilton. -Must have been a pretty exciting trip. So you've got the biography, signed by the great Muhammad Ali. Where were you when he signed it? -That was in the lounge of the hotel at the Hilton. -And what was he like, did he sign it with pleasure? -Muhammad Ali, I think he won the Olympic gold medal in 1960. -at the age of 22. This is 14 years later, isn't it? didn't he, to Leon Spinks? -And are these photos you took yourself? -Was this in the build-up to the fight? -No, training, you could pay to go and see them train. -They were all training in the Hilton. Ali, that's how he lost really, cos he didn't train that well. and didn't train properly enough? but he wasn't as good as Leon Spinks. -you still have to put the work in. Now then, why have you suddenly decided to sell them, John? I've just had them in the drawer. -"Aw there's a book, I'll write on it." -It would ruin it, wouldn't it? not that high because he signed a lot of stuff. so the signature's not that rare. you're probably worth £30-35. Sound all right? That's all right for me, I've not a clue, I'll take your word for it. Is there any price at which you'd rather have them back? -No, just let them go. because they don't come much bigger. -So I'm looking forward to seeing how it sells. -Hopefully we'll get a knockout price. Time there for Adam. It's over to Anita now for round two. and it's lovely to see these terrific bits of Mason's. Tell me, how did you come by them, is this the kind of thing you like? Tell me about your association with Mason's. -and now I've got over 60 pieces. And the other things are just spread through the house? -But why are you wanting to sell them, Ann? Well, sadly, I'm moving. My house is up for sale at the moment. And I'm moving into a 1930s bungalow. And I will have to buy things that match my new house. I will take some of these things with me, but not these pieces. Tell me, why Mason's in particular? I just think they're robust and strong and decorative. they're transfer printed, and let's have a wee look underneath. but we can see an engraved or an incised stamp for Ashworth's. they bought over all the patterns and moulds and so on. so they are a good age. has been repaired, it has been stapled. -I think it's interesting the way they staple things, don't they? I love that as well. -Oh, that would be fine. Yeah. ..and perhaps give the auctioneer some discretion on a reserve of £50. I just want them... to be loved somewhere, really. -You want them to be loved. -No, it's not sad at all. I mean, they are just pots, aren't they? -I think it's absolutely lovely, it will certainly draw the bids in. -It's been lovely to meet you and good luck with your new house. Very nice to see your collection of regimental swagger sticks. I feel I should be standing straight when I talk to you with these. And you're a former Lancashire Fusilier yourself, aren't you, Jim? Yep, I was a physical training instructor. OK, is that what gave rise to the collection? I bid for it and won it, and my interest grew from that. so perhaps you could explain that. the NCO might just come along and give you a whack on the back. -Give you a little crack on the back with it? -And then later it became just a sort of ceremonial thing? -A mark of your rank and that. -A mark of your rank and station. This one's particularly interesting and is why we've singled it out. -Of course, it's a Lancashire Fusiliers' one, isn't it? But it's engraved here to... GE Tallents. -Now, you've done a bit of research about this, haven't you? he took over the 2nd Battalion, The Lancashire Fusiliers in India. -So he had a pretty distinguished military career, didn't he? So, how did you find this one? Was that online as well? -Yes, that was online, I was quite lucky with that one. Go on, you're smiling, it was cheap? Well, it just... I put my bid in and I got it for £19. £19, that's not bad at all. Jean, what do you think of the collection? I think it's brilliant, I've really had to force him to bring them today. -What, you've forced him, but yet you are an enthusiast, so what...? -He's downsizing and we need to get rid of quite a bit of stuff. -It'll hurt him doing this, but it needs to go. What sort of thing do you think they are going to fetch? -I've got an idea of 300 or 400 quid. -Well, there's 12 of them, aren't there? -And simple maths... They're worth more than 20 quid each, that's 240, isn't it? -30 quid each is 360, so they must be worth that. but on average, 30 quid a lot. -So if we put 300 to 400? -Put a reserve of 300? -they're going to go to a collector just as passionate as you. Thanks very much for coming, I've really enjoyed talking to you. -this little clog is instantly recognisable. -You know what it is. -I do, yes, Clarice Cliff. Some people love Clarice Cliff, some people hate them. she was a genius and she was clever enough to marry the boss. -Tell me, where did you get this? I got it from a friend of mine who's sadly gone now. "We need to put this in a cabinet to keep it safe." And she just went, "No, you can have it." so I brought it home and put it in the cabinet. So you're obviously, like me, an admirer of Clarice Cliff. and I like that era, you know. -Let's look at it a wee bit more carefully. so it would have been a novelty item. But quite interesting. Fantasque, and we see the signature of Clarice Cliff here. This would have been made in the 1930s. -And the pattern is called the Melon pattern. So we can identify that exactly to the time. is I love the combination of blue and yellow and orange there. I think they shout at you, they shout Clarice Cliff. I was a bit concerned that there wasn't colour all over. I thought it would have been coloured in. -there wouldn't have been machines there. -So she wouldn't have been letting anybody miss bits out. -If that bit's missed out, it's meant to be missed out. and this is an unusual little object. -What do you think on value? I know they came in different sizes. I don't know, £100? -I think you're very good. -Let's make it low and wide. -and that's giving plenty of expansion. Plenty of expansion. But I think we will put a reserve on it. -Yes, I'd like a reserve on it. -I think we should put £100 reserve. -So, thank you very much for bringing that along. Well, sadly it's time to say goodbye to our host venue today, the Discovery Museum. their final items to take off to auction. pull in the bidding heavyweights? when it comes to these Victorian ceramics? Clarice Cliff lovers will be delighted by this novelty clog. and auctioneer Giles Hodges is about to test our next lot. -and it's a left shoe, isn't it? It is the left shoe, am I right? It's not the right foot? Did they make pairs or were they all left feet? Karen, what do you think? -Probably didn't make pairs, I would think. -No, I reckon they're all left feet. -Why are you selling this? Do you like it? But I just brought it along and thought, "Well, give it a go." "What's it worth?" And hopefully, £200. Have you sold many of these clogs? Yes, lots and lots of them. and they bring a smile to folk's faces, and that's why we like them. Question is, will they pay top money for it? We're going to find out right now. We've got the little Clarice Cliff Melon pattern clog. -I have one, two, three, four bids. I'm straight in at 140. -Well, it's sold, Karen, hasn't it? The bid's upstairs in the room at 170. The commissions are out. Yes! The hammer's gone down. That is a classic collectible, isn't it? Will you reinvest that money in antiques or...? No, I think I'll just treat myself. so we'll probably use it for that. -Clarice Cliff never lets us down. Let's hope the same can be said of our next item. and we all have a swagger in our step, because so far we've sold all our lots. We have the swagger sticks coming up now, there's a collection of 12.
you've made this a big part of your life - they will buy heavily into them. -Yeah. You're going to be sad, aren't you, when these go? On three or four of them. because it's going under the hammer right now. I'm bid 200 to start them. At 200 for the swagger sticks. 220, 240, 260, 280, 300. It's in the room at £300. At £300, are we all done? At £300, and we shall be away at £300. There we go, they've gone, well done. Well done, both of you. Which ones will you miss out of that collection? -The Lancashire Fusiliers and the Northumberland Fusiliers. -Have you got any other memorabilia at home? -Yeah. So you haven't sold everything? -Jean's enjoyed the experience, haven't you, Jean? Well, I've just been joined by Ann, who is in the process of downsizing. You're moving from a Victorian terrace to a bungalow, smaller? So are you going to go for a little bit of Art Deco look, then, or...? -Yes, but not Clarice Cliff. Don't get me going, whatever you do! I love Clarice Cliff, stop knocking it! -and there's no reserve, so it's here to go. Fingers crossed we will get that £50 to £60 and not the £10. Right, let's put the value to the test. let's hand the proceedings over to today's auctioneer. and 50 starts me, straight in at £50. At £50 for the lot. Five, anybody? At £50, it's all quiet. At £50, the internet's quiet too. -Just on the bottom reserve, though. -You said no reserve on this, didn't you? -Could have gone for a tenner! -I think we're all happy with that, don't you? 'to trade the old for the new. 'to decorate her new home. 'It's the countdown for our last lot. but it is a knockout, isn't it? Let's face it, this is a good thing. Yeah, yeah, and if it doesn't sell well, we'll take it on the chin. -There you go, you thought about that one. It's a good 'un, aye! it's going under the hammer, good luck. I have, again, one, two, three, four bids. I start at 75. 100, 110. 120, 130, 140, 150, 160. It's on my left at 160. 170.
punching it out with each other. Who's got the deepest pockets? At £180, are we all done at 180? -That's a big smile on your face, isn't it? Well done, Adam, for spotting that in a queue as well. -It's just cos the wife says, "Oh, you'll be lucky to get 50 for it!" standing in an auction room like this, going home with 180 quid. the big names always hold their value. 'And that one was definitely a winner. and what a day it was, I thoroughly enjoyed it, I hope you did too. Bring them along to one of our valuation days. or check the details in your local press. We'd love to see you. But for now, from the North East, it's goodbye from all of us. The Flog It! team is in Newcastle upon Tyne at the Discovery Museum, the region's science and social history museum, with incredible collections relating to Tyneside's nautical history. Antique experts Anita Manning and Adam Partridge join presenter Paul Martin as the team set out to go through hundreds of antiques and collectables brought along by members of the public to the valuation day in Tyneside. The lucky ones make it to the auction room where anything can happen. While on Tyneside, Paul finds out about the river's last shipbuilders whose whole lives revolved around an industry that came to an abrupt end in this area at the end of the twentieth century. Paul also travels to the birth place of Thomas Bewick, the famous Northumbrian engraver whose work made images of previously unknown animals available to the wider public.